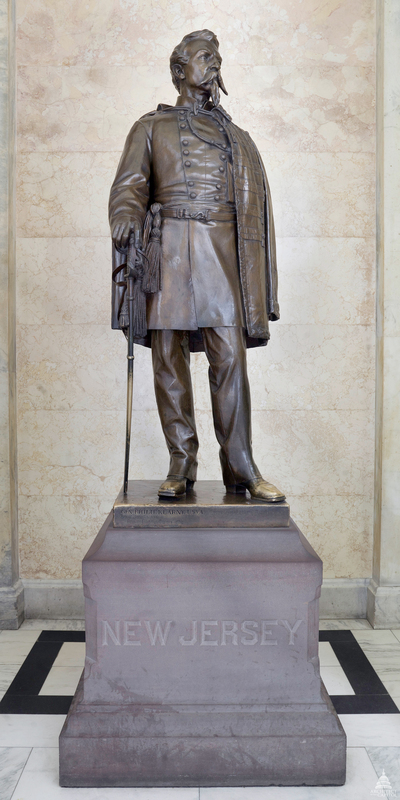 This statue of Philip Kearny was given to the National Statuary Hall Collection by New Jersey in 1888. Philip Kearny was born on June 1, 1814, in New York City to a rich and socially prominent family. Because his mother died when he was quite young, Kearny spent his early years in a series of boarding schools and made his home with his maternal grandfather. Kearny attended Columbia University and studied law, but he decided to follow a military career. As a second lieutenant in the First United States Dragoons, commanded by his uncle, Kearny was sent to France to study cavalry tactics. He soon distinguished himself when he served with the Chasseurs d'Afrique in Algiers in 1840. He returned to the United States and became an aide-de-camp to General Alexander Macomb, commander-in-chief of the army, and later to his successor, General Winfield Scott. He then married, started a family, and resigned his commission in 1846. He was immediately called back into service, however, to lead the advance on Mexico City in the Mexican War of the same year. Kearny's left arm was shattered in battle and had to be amputated. Kearny again withdrew from military life, but in 1859 he served on the staff of General Morris in France. He returned to the United States at the outbreak of the Civil War and served as a brigadier general with the Army of the Potomac. He lost his life in the Battle of Chantilly, Virginia, on September 1, 1862.